Alejandro Sousa provides legal advice to the President of the 71st Session of the United Nations General Assembly and his Office. He serves as the focal point for the Sixth Committee, as well as for Oceans and Law of the Sea, Rule of Law and international courts and tribunals. In addition, Alejandro deals with International Humanitarian Law, Human Rights and Counter-terrorism. He served as Legal Adviser to the President of the 70th Session and was the Legal Adviser of the Permanent Mission of Mexico to the UN and its delegate to the Sixth Committee from the 67th to the 69th General Assemblies. Alejandro joined the Foreign Service of Mexico in 2005. Prior to his posting to New York, he served as Legal Adviser in the Mission to the European Union in Brussels, in charge of Human Rights, Justice, Home Affairs and Council of Europe. He has also served as consul, specializing in border affairs, migration and community outreach. 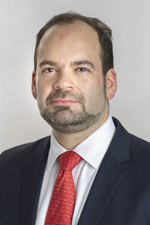 Alejandro has participated in several negotiations including the Arms Trade Treaty (ATT), the process of marine biological diversity beyond areas of national jurisdiction (BBNJ), the Open Working Group on Sustainable Development Goals, and the Comprehensive Convention on International Terrorism (CCIT). He was elected Vice-President of the twenty-fifth Meeting of States Parties to the Convention on the Law of the Sea and Vice-Chair of the Special Committee on the Charter of the UN and on the Strengthening of the Role of the Organization. He is fluent in Spanish, English and French.